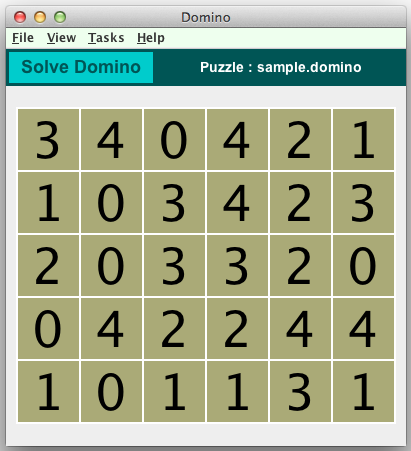 A DOMINO puzzle consists of a rectangular grid, with each cell of the grid occupied by a single digit number. The grid represents a set of domino pieces laid out in a rectangular array. For example, if you use a "standard" domino set having pieces ranging from 0-0 spots to 6-6 spots, then the rectangle will be 8 cells across and 7 cells down. The puzzles can be made in various sizes, depending on the size of the domino set you use. To solve such a puzzle, it is necessary to outline pairs of adjacent numbers in such a way that every piece of the domino set is revealed. Each puzzle has a unique solution, and can be solved without recourse to guesswork. 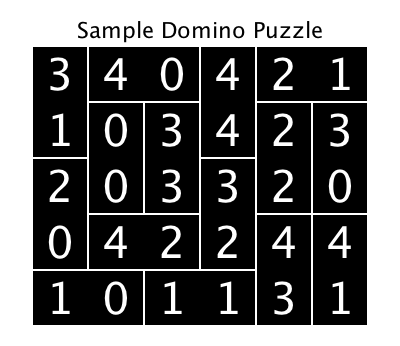 The following graphics show a Domino puzzle in the Crossword Express Solve screen and a PNG graphic file produced by the program's print function, showing the complete puzzle solution. See also a full size version of a PDF file showing the solution. Fully automatic construction of puzzles. Puzzle sizes are determined by the domino set used in their construction. This can range from a minimum of 0-0/3-3 up to a maximum of 0-0/9-9.